The. 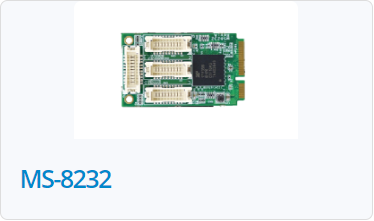 MS-352/MS-400/MS8232 is rugged Mini PCIe modules that are ideal for adding extra serial port capabilities to any system with minimal increase in overall system size and power consumption. MS-352 offering switchable RS-232/422/485, optional isolation and full modem control signals. MS-400(4 port RS-232)/MS-8232(8 port RS-232) is rugged Mini PCIe modules that are ideal for adding extra serial port capabilities to any system with minimal increase in overall system size and power consumption. The wide operating temperature and latching connector and cabling solution allow these modules to be used in harsh environments. 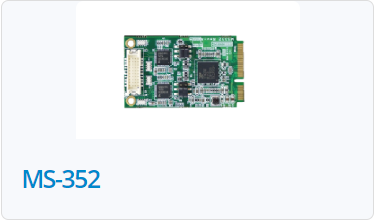 Compatibility with a large variety of popular operating systems allows these boards to be easily integrated into a wide array of new and existing systems. ASDA ICT offers new APC-1252T/APC-1552T Panel PC products for industrial applications. The APC-1252T/APC-1552T panel pc computer is an all-in-one and compact system designed around a highly integrated Intel® Graphics Media Accelerator (GMA) chipset motherboard computer which is equipped with an industrial TFT LCD display. Features an embedded Intel® Pentium® /Celeron® Bay Trail processor, it offers a compact design for limited space environments to meet the demanding performance requirements of business and industrial applications including factory / warehouse / home automation, digital signage, kiosk, network communication and information terminal. ASDA ICT offers an AD Board product ADB0131of display products for industrial applications. For use in bright environments with high levels of ambient light. For the food and chemical industries, or other industries with similar demands. For general applications, there are sturdy and durable industrial displays with steel construction. In addition, ADB0131 can support wide range power input DC 12~32V and are equipped with a industrial standard terminal block connector, DVI-D/DP/VGA input ports, LVDS or eDP(option) output, amplifier speaker out. ASDA ICT offer the optional function for auto dimming and back light current detect and RS232 control interface in future. 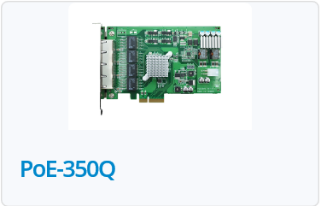 PoE350D/PoE350Q is the PCIex4 interface PoE module (Power over Ethernet). 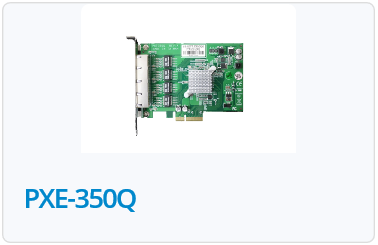 ASDA’s Quad-Port Gigabit Ethernet PCIe 4-Lane Card – PXE350Q is designed to add four RJ-45 Gigabit Ethernet ports to your PCI Express enabled server or desktop system. It delivers up to 1000 Mb/s data transfer rate for high speed, high-bandwidth data or multimedia content transferring.It also supports full duplex mode and power management feature for increased speed and power efficiency. It instantly enhances your networking performance with high speed, high-bandwidth reliable network connectivity from a workstation with 10/100/1000 Ethernet port or without networking capability. PXE350Q features innovative power management including Energy Efficient Ethernet (EEE) and DMA Coalescing to increase efficiency and reduce power consumption. 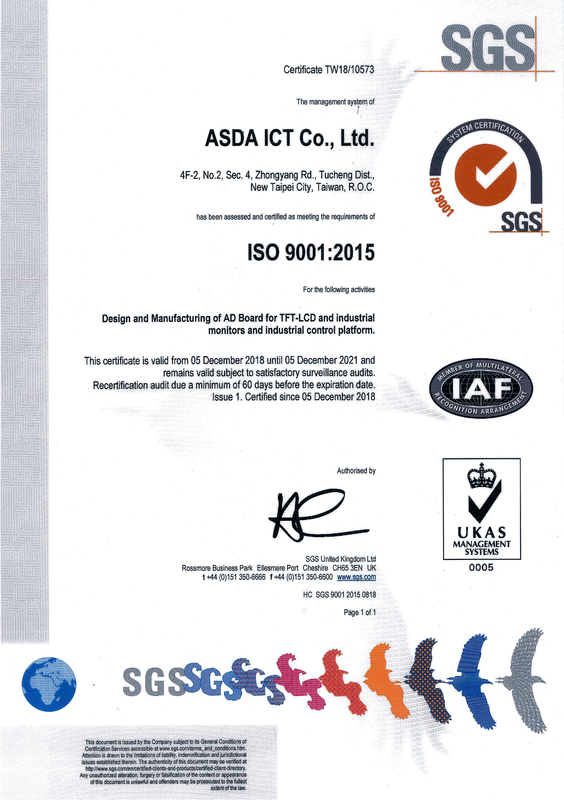 ASDA ICT announced they have passed their ISO 9001:2015 surveillance audit. ISO (International Organization for Standardization) is the world’s largest developer of quality standards. These standards contribute to making the development, manufacturing and supply of products and services more efficient, safer and cleaner. Surveillance audits are mandatory every year for two years, and a complete recertification must take place every third year to retain this prestigious recognition. This was ASDA ICT’s third recertification audit since becoming ISO certified in 2015. It is evident throughout the company that they have truly embraced the ISO quality management system. ASDA ICT has demonstrated that they use ISO as a platform for continual improvement of their processes, products, and most importantly, customer satisfaction as a result of their commitment”. Asda is a technology leader in embedded computing technology. With more than 25% of its employees in R&D, Asda creates many of the experienced SOP to follow the standard that drive and integrate the world's embedded computing platforms. Asda ICT's product longevity, engineering, support, and value-added services helps to create a sustainable and viable industrial control solution for ODMs and system integrators. The world's largest business database, the US firm's customers (Dun & Bradstreet) 10/20 held in the Taipei International Convention Center Ballroom on the third floor Grand "2016 D&B SME elite Award" Forum and awards ceremony, standing Vice Minister of Economic Affairs Yang Weifu issued special scene TOP 1000 MVP awards to McNair precision machinery, puricom enterprise, Also urged the whole hundred award-winning small business owners, in the fog of the global economic slump, to know how to stand on the shoulders of Giants campaign worldwide to create a success! Yang Cichang said Taiwan 138 million SMEs, which elected TOP 1000 SMEs elite, 2015 years of Taiwan's total exports of 9.7% ( about 273 million US dollars ), can be said to be very rare, is Taiwan the backbone of the export-led growth. 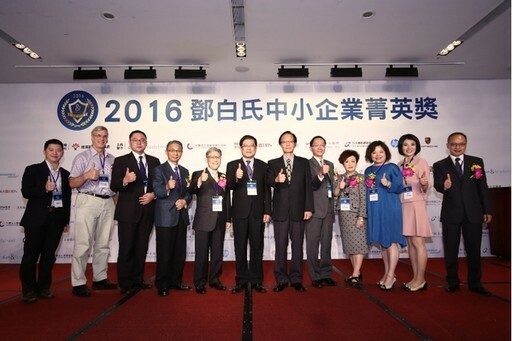 "2016 D&B SMEs Elite Award" this year is third years held, by Economic Department SMEs at Guide, beauty business customer’s Taiwan branch hosted, Consortium corporate commercial development Institute organized, "export value network" Union partners: Star exhibition Bank ( Taiwan ), and in the Philip line, and China output into Bank, and long big information, and Taiwan HP information technology, and United States Owen's ( Hong Kong ), Porsche Taiwan joint. Through the national database than the export data of SMEs as well as large data, payments from financial stress index, indices, purchasing power index, the past 3 years the export performance, the export growth rate, export grade conditions, export performance from 30 million small and medium enterprises, selected the most export competitive power of 1000 companies. 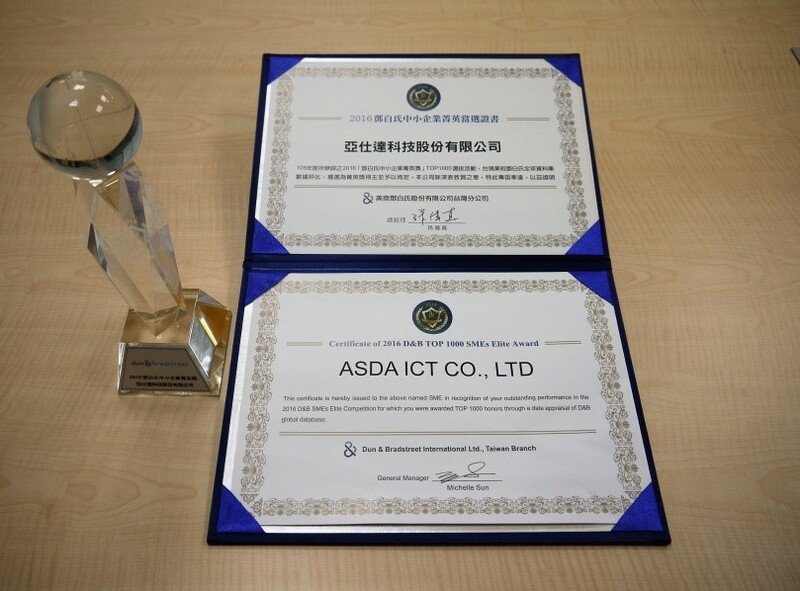 ASDA ICT C., LTD. is honored to win the awards. Because the awards based on objective data as a basis, without subjective judgment or external influence, so favored by the recognition and affirmation of the small-business owner! Awards ceremony guest gathered, produced official Institute led characters, including: Economic Department Yang Weifu Executive Minister, and Economic Department SMEs at Ye Yunlong Director, and Economic Department international trade Council trade development group Zhang Shuyi deputy leader, and beauty business customer’s Hong Kong and the Taiwan Director General Manager-Ming Joseph,, and beauty business customer’s Taiwan branch Sun Weizhen General Manager, and star exhibition Bank ( Taiwan ) enterprise and the institutions Bank CAI mingzhi implementation Director, and in the Philip line international logistics north Taiwan business at Wu weiwen Manager , The export-import Bank of China Liu Peizhen, General Manager of Ke, long big information is as beautiful as the associate and the Taiwan company Hu Shiwei, Chairman of information technology, visit the site address, the ceremony, and continued to act as presenters, is hope through concrete action, to express support for the award, as well as the Taiwan small and medium enterprises respect, access to TOP 1000 small business owners very happy and feel honored. Beauty business customer’s Hong Kong and the Taiwan Director General Manager-Ming Joseph, speech Shi talked about, export is Taiwan economic growth most main of drive force, by international market overall needs weak, and global industry competition increased, and China city capacity excess, and supply chain independent of exclusion effect, adverse factors interference, Taiwan export this year had hit history Shang even 17 black, is financial tsunami yilai most long recession records. However, there is still the outstanding SMEs cool battle, rushed out of the crowd, create excellent export performance, intelligent and strong, we have to admire these business leaders, won the customer’s SME elite Award for TOP 1000 praise deserved, and people cheer. New Taipei City, Taiwan, Nov 15th, 2013 - Asda ICT unveils it's new high brightness product line to build its CEM service capability to enhance and sustain the customer various needs. The Asda high brightness portfolio is ideally suited for interactive machine or outdoor visualization tasks. High brightness LCD panel devices integrate an industrial display and an operating unit, and then offer a winning combination of water-proof, performance and high brightness display. The various Asda display choices meet a wide range of digital signage requirements. From interactive operation and advertised transfer and commercial marketing, Asda ICT offers you powerful high brightness LCD panel solution, and all in one High Brightness monitor in its Outdoor Digital Signage Appliance portfolio. They are ideal for advertised diversification in outdoor environments, and always include easy touch screen operation. The Asda Outdoor Digital Signage Appliance portfolio is ideally suited for interactive machine or outdoor visualization tasks. The various choices meet a wide range of marketing and outdoor requirements. Our mission is to provide OUTDOOR-environment fit digital signage products which meet both sunlight readable & water-proof like IP65 at front side, and also innovative interactive digital signage products with friendly interface. We provide the flexibility to swiftly evolve our products in line with technological advancements in terms of Scalability, Serviceability, and Reliability. Our mission is to provide OUTDOOR-environment fit digital signage products which meet both sunlight readable & water-proof like IP65 at front side, and also innovative interactive digital signage products with friendly interface. We provide the flexibility to swiftly evolve our products in line with technological advancements in terms of Scalability, Serviceability, and Reliability. Asda ICT not only knows what customers need, but also understand what digital signage requires via years field engineering experience. Except the design rule of "Prevention is better than Treatment", Asda ICT engineers is even more focus on the fundamental of customer's service cost starting from Designing. Asda ICT help our customers reduce their time-to-market and gain a competitive advantage with experienced SOP to achieve better QCDS for customers. The business and working model for the ODM at Asda called Customer Engagement Models (CEM), CEM workflow is designed to be seamless integrated from customer's requirements to mass production until whole product life cycle. Asda ICT's performs the IP65 design not only water proof, but also cutting oil proof by Asda patented enhanced seal design. Of course, which can be applied to front panel only, or whole device depends on customer needs. "Today's announcement marks a new chapter in the evolution of Asda ICT" said Mr. Chen. "Many of the new product features / enhancements and Service model have resulted from listening and responding to the challenges posed by today's Industrial display market needs." New Taipei City, Taiwan, May 21st, 2012 – Asda ICT unveils it’s new HMI full product line to build its CEM service capability to enhance and sustain the customer various needs. The Asda HMI Panel PC portfolio is ideally suited for direct machine or plant visualization tasks. All in one Panel PC devices integrate an industrial PC and an operating unit, and then offer a winning combination of ruggedness, performance and brilliant display. The various Asda Panel PC choices meet a wide range of manufacturing and process automation requirements. From close-to-machine operation and monitoring to control, data processing and motion control tasks,Asda ICT offers you powerful all in one industrial PCs in its FA HMI Appliance portfolio. They are ideal for production processes in harsh industrial environments, and always include easy touch screen or membrane-keyboard operation. The Asda FA HMI Appliance portfolio is ideally suited for direct machine or plant visualization tasks. All in one Panel PC devices integrate an industrial PC and an operating unit, and then offer a winning combination of ruggedness, performance and brilliant display. The various choices meet a wide range of manufacturing and process automation requirements. Our mission is to provide FA-environment fit HMI display products which meet both vibration & shock resistance like machine tool, and also innovative interactive HMI products with friendly man-machine interface. We provide the flexibility to swiftly evolve our products in line with technological advancements in terms of Scalability, Serviceability, and Reliability. Our mission is to provide FA-environment fit HMI display products which meet both vibration & shock resistance like machine tool, and also innovative interactive HMI products with friendly man-machine interface. We provide the flexibility to swiftly evolve our products in line with technological advancements in terms of Scalability, Serviceability, and Reliability. Asda ICT not only knows what customers need, but also understand what Factory Automation product requires via years field engineering experience. Except the design rule of “Prevention is better than Treatment”, Asda ICT engineers is even more focus on the fundamental of customer’s service cost starting from Designing. Asda ICT help our customers reduce their time-to-market and gain a competitive advantage with experienced SOP to achieve better QCDS for customers. The business and working model for the ODM at Asda called Customer Engagement Models (CEM), CEM workflow is designed to be seamless integrated from customer’s requirements to mass production until whole product life cycle. Asda ICT’s performs the IP65 design not only water proof, but also cutting oil proof by Asda patented enhanced seal design. Of course, which can be applied to front panel only, or whole device depends on customer needs. Asda is a technology leader in embedded computing technology. With more than 25% of its employees in R&D, Asda creates many of the experienced SOP to follow the standard that drive and integrate the world’s embedded computing platforms. Asda ICT’s product longevity, engineering, support, and value-added services helps to create a sustainable and viable industrial control solution for ODMs and system integrators. New Taipei City, Taiwan, May 17th, 2012 – Asda ICT unveils it’s new Dimensioned Signage full product line to extend her display technology to build its CEM service capability of solution building block to enhance and sustain the customer various needs, and mostly important is to increase customer value. The Dimensioned Signage product line includes DSD resizing display product line, DMP media player product line, OMP open frame media player product line, and HBD high brightness product line. Which can give Asda the opportunity to offer one stop shop for various digital signage applications. Our mission is to provide a customized digital signage display replacement which meet from transportation, enterprise building and government public applications, to shop store and elevator environments based on Asda ICT’s portfolio display technology, and also can satisfy special cut size, high brightness, open frame front, and media player without the need for additional box. We provide the flexibility to swiftly evolve our products in line with technological advancements in terms of Customized display technology, Serviceability, and Reliability, said Mr. Hwang, COO of Asda ICT. Today, Advertising using digital signage is a form of out-of-home advertising in which video content, advertisements and messages are displayed on digital signs with a common goal of delivering targeted messages to specific locations at specific times. Digital signage technology is the answer of electronic display that shows television programming, menus, information, advertising and other messages. Digital signs (such as LED matrix, LCD display, plasma displays, or projected images) can be found in public and private environments, such as retail stores, hotels, restaurants, transportation utility and corporate buildings. The market sees digital signage as more beneficial compared to static signage because content that updates frequently can be digitally updated, saving the cost of printing., furthermore, creating good advertising value and produce good return for investor compare to other way of advertising. LCD panel also cut to fit any display space has been used in a familiar place, such as transportation. Asda ICT can provide high quality COTS Glass, cut to fit your envelope with the resolution & brightness required to meet today’s demanding specifications. Asda ICT has in-house clean room facilities with the technology, equipment and tooling to resize LCD Glass and has been successful in cutting LCD's in both the horizontal and vertical directions. New Taipei City, Taiwan, March. 21st, 2012 – Asda ICT unveils it’s new Dimensioned Signage product integrated with POG (Pad on Glasses) to extend her display technology to build its CEM service capability of solution building block to enhance and sustain the customer various needs, and mostly important is to increase customer value. Our mission is to provide a customized whole-in-one module (including POG and Resizing LCD panel) which meet from factory automation, enterprise building and government public Kiosk, vending machine, shop store and elevator environments based on Asda ICT’s portfolio display solution. We provide the flexibility to swiftly evolve our products in line with technological advancements in terms of Customized display technology, Serviceability, and Reliability, said Mr. Hwang, COO of Asda ICT. The Asda’s Dimensioned Signage Resizing Display technology not only highlights digital signage as an innovative medium for targeted information, entertainment, merchandising and advertising but also dimension the technology to address the needs of those targeted space and targeted usage of display. Advancements in display technologies, falling manufacturing costs and a retail boom in emerging economies are contributing to the economic uptake and rapid spread of large-scale high-definition display networks. The POG technology identifies trends to making digital signage more interactive and pervasive and describes why interoperability and global standards are key to tapping the medium’s full potential. It is a perfect combination of POG plus Asda Dimensioned Signage Resizing Display, this combination is to reinvent something people do not have the solution in the past. Asda POG can be used to develop touch-based button, slider and touchpad interfaces, which are more intuitive and enable aesthetic and innovative product designs. Asda can design the free shape of key pad to be integrated with Asda Dimensioned Signage Resizing Display to meet many innovative need and applications. The typical applications is Vending machine or HMI Display. Asda is a technology leader in embedded computing technology. With more than 25% of its employees in R&D, Asda creates many of the experienced SOP to follow the standard that drive and integrate the world’s embedded display solution and platforms. Asda ICT’s product longevity, engineering, support, and value-added services helps to create a sustainable and viable industrial control solution for ODMs and system integrators. New Taipei City, Taiwan, March. 16th, 2012 – Asda ICT unveils it’s new Dimensioned Signage product line to extend her display technology to build its CEM service capability of solution building block to enhance and sustain the customer various needs, and mostly important is to increase customer value. Our mission is to provide a customized resizing LCD display module which meet from transportation, enterprise building and government public applications, airport site, shop store and elevator environments based on Asda ICT’s portfolio display solution. We provide the flexibility to swiftly evolve our products in line with technological advancements in terms of Customized display technology, Serviceability, and Reliability, said Mr. Hwang, COO of Asda ICT. There are so many unique digital signage applications not only needs a quality LCD display but also require a tailor-made size of LCD display to satisfy both functional and existing space needs to various kind of applications, and half cut and one third cut is most popular resizing at 19”/32”/42” size, Asda ICT extend her display technology to customize the display with tailor-made flexibility by years experience and integration technology to meet market needs. LCD panel also cut to fit any display space has been used in a familiar place, such as transportation on railway/MRT/Bus platform and internal car. Asda ICT can provide high quality COTS Glass, cut to fit your envelope with the resolution & brightness required to meet today’s demanding specifications. Asda ICT has in-house clean room facilities with the technology, equipment and tooling to resize LCD Glass and has been successful in cutting LCD's in both the horizontal and vertical directions. New Taipei City, Taiwan, March. 12nd, 2012 – Asda ICT unveils it’s new solution to extend her display technology to build its CEM service capability of solution building block to enhance and sustain the customer various needs, and mostly important is to increase customer value. Our mission is to provide a customized POG (Pad On Glasses) module which meet from transportation, enterprise building and government public applications, to shop store and elevator environments based on Asda ICT’s portfolio display solution. We provide the flexibility to swiftly evolve our products in line with technological advancements in terms of Customized display technology, Serviceability, and Reliability, said Mr. Hwang, COO of Asda ICT. Asda ICT’s POG touch-sensing solution has not only replaced mechanical buttons in mobile handsets, laptops, consumer electronics, white goods, industrial, medical, automotive applications, and virtually any system that has a mechanical button or switch, making Asda ICT the industry POG touch-sensing leader. The POG portfolio, the industry's display broadest and most integrated, enhances industrial design and reliability with the most noise-immune and water tolerant capacitive touch-sensing interfaces, including proximity sensing where direct touch is not required. POG with proximity sensing, with its industry-leading detection range up to 25 cm, which provides user a friendly and fashion using experience. Think Display is more than a Display as it was. Take a example, we can combine POG technology with Asda Dimensioned Signage Resizing Display product as a Digital Signage with Glasses Pad, which could be a Luxury elevator panel (including Resizing LCD panel+POG), or a ticket machine for Japan restaurant, etc., we believe there are many applications waiting to be developed for POG usage. New Taipei City, Taiwan, Jan. 20th, 2012 – Asda ICT unveils it’s new solution to extend her display technology to build its CEM service capability of solution building block to enhance and sustain the customer various needs, and mostly important is to increase customer value. Our mission of dimensioned signage product line is to provide a customized display which meet various applications. Asda ICT always listen to market voice and response the right technology in time, this is why e-paper based display born to meet market needs. We provide the flexibility to swiftly evolve our products in line with technological advancements in terms of Customized display technology, Serviceability, and Reliability, said Mr. Hwang, COO of Asda ICT. A perfect example for Dimensioned Signage e-Paper displays enable electronic pricing label solutions from the stockroom to the retail floor. Coupled with wireless communication infrastructure and software, effective systems may be generated for retail clients. Our Dimensioned Signage e-paper display product can offer customized sizes. Along with ePaper display technology, Asda ICT offers services to manufacture custom display product to enable you to get quickly to market. Unlike LCDs which are made with glass, the e-paper display is extremely thin and yet durable to withstand repeated impact shock. Readable like paper, it has nearly a 180° viewing angle and maintains high contrast in uneven lighting conditions. Asda ICT Dimensioned Signage e-paper product prolongs battery life, drawing power only when switching due to its bistable image characteristics. Asda ICT therefore wants to continue to rapidly expand this business area with new product lines and technically competent distribution partners. “Because we also want to strengthen the design and production of customer-specific special formats, we very consciously did not look for a conventional distributor, but rather a professional ODM with many years of design-in experience that can comprehensively offer right solution to the correct market during application development in the area of displays. New Taipei City, Taiwan, Jan. 16th, 2012 – Asda ICT announce to upgrade office space to enlarge its CEM service capability of solution building block to enhance and sustain the customer service, and mostly important is to increase customer value. Our mission is to provide a customized ODM service with enough space and which meet customer’s growing needs. Asda ICT provide the flexibility to swiftly evolve our CEM service in line with technological advancements in terms of Customized display technology, Serviceability, and Reliability, said Mr. Hwang, COO of Asda ICT. Said Mr. Hwang, COO of Asda ICT, "Because of the increased popularity of our CEM service and our desire to further improve and extend our product we have taken on additional staff to drive our vision forward. Combined with the ever growing interest to reinvent display technology and new product, this is an exciting time of growth for us as a company." New Taipei City, Taiwan, Jan. 6th, 2012 – Asda ICT announce to reinvent resistive touch screen controller to extent its CEM (Customer Engagement Model) service capability of solution building block to enhance and sustain the customer service, and mostly important is to increase customer value. Our mission is to provide a customized ODM service by offering combo touch screen controller technology. Asda ICT provide the flexibility to swiftly evolve our CEM service in line with technological advancements in terms of Customized display technology, Serviceability, and Reliability, said Mr. Hwang, COO of Asda ICT. Resistive 4- and 5-wire touch systems belong to the most popular and most common touch screen technologies especially in the industrial display market. Their market share is over 75%, mainly due to their low costs and simple interface electronics. Resistive System can be found in various industrial display market sector like bank ATM, Kiosk, factory automation HMI, etc. In the past,, customers need two controllers to connect to 4-wire or five-wire touch screen, and it is not easy to manage the stock and service. Now Asda ICT unveils the new touch screen controller which can cover both 4 and 5-wire touch screen. It is not only benefit the stock management for the customer, but also give customer a advantage to save the maintenance cost. New Taipei City, Taiwan, Dec. 29th, 2011 – Asda ICT unveils it’s new solution to extend her display technology to build its CEM service capability of solution building block to enhance and sustain the customer various needs, and mostly important is to increase customer value. Our mission is to provide a customized cut-size display replacement which meet from transportation, enterprise building and government public applications, to shop store and elevator environments based on Asda ICT’s portfolio display technology. We provide the flexibility to swiftly evolve our products in line with technological advancements in terms of Customized display technology, Serviceability, and Reliability, said Mr. Hwang, COO of Asda ICT. Thanks to the patent and display technology of Asda ICT, Asda ICT offer the cut size display not only meet space need but also free heating issue with fanless technology. New Taipei City, Taiwan, Dec. 5th, 2011 – Asda ICT unveils it’s new solution to extend her display technology to build its CEM service capability to enhance and sustain the customer various needs. Our mission is to provide a customized legacy display replacement which meet from factory floor equipment, to surveillance, avionics and marine applications, to hospital and clean-room environments based on Asda ICT’s display technology. We provide the flexibility to swiftly evolve our products in line with technological advancements in terms of Customized replacement, Serviceability, and Reliability. The most important is not only users to keep their previous investment on the equipment, but also give our hand for earth protection. With today fast-emerging technological advancements, most of companies are finding it very tough to support their legacy monitor product lines. Replacements for the once-popular MGA,EGA, CGA or MDA TTL monitor standards for older systems are almost impossible to find. Asda ICT is the answer. If they are not already compatible, Asda ICT display technology can be configured to accept these legacy TTL digital input standards. In addition, we've added touch screens, magnetic shields, NVIS night vision capability, and sunlight-readable capability to various models. To suit your particular display need, we can configure these quality LCD monitors to operate with the wide variety of video formats these older, legacy CRT monitor systems often employed, such as; 16 color CGA and 64-color EGA TTL formats, RS-170 and RS343 composite analog Sync-on-Green (SOG) formats, and other variations. We also designed solutions for even more specialized input requirements such as differential digital and analog video input, Automatic Gain control composite video, and others. New Taipei City, Taiwan, Nov. 1st, 2011 – Asda ICT unveils it’s new approach to FA HMI Appliance solution to build its CEM service capability to enhance and sustain the customer various needs. New Taipei City, Taiwan, Oct. 24th, 2011 – Asda ICT unveils it’s new approach to POS solution to build its CEM service capability to meet customer various needs. By selecting long-life components from Intel's embedded roadmap, the Asda ICT POS terminal delivers a powerful and stable solution built for the long term. Asda ICT’s POS performs the smallest form factor in its class with advanced design tool like thermal analysis for the layout of EE & ME, etc., Optical bonding to insure slim with reliability. With a slim all-in-one design of target, Asda ICT performs flexible mounting options and can serve as a POS workstation or a media POS. Engineered to provide years of dependable operation, Asda ICT includes a rugged enclosure, long-life LED display and fanless operation to increase reliability. Driving the best energy efficiency in its class, Asda ICT has earned the distinguished ENERGY STAR® qualification to help your bottom line and the environment. New Taipei City, Taiwan, Oct. 12nd, 2011 – Asda ICT unveils it’s new web site with a dynamic, new look that provides online visitors with dramatic improvements in navigation, uniformity, appearance, and accessibility to users with disabilities. » Improved Navigation - Web pages work in intuitive and consistent ways, making it easier for visitors to find what they are looking for and know where they are within the web site. » Improved Look and Feel - Enhanced graphics and the new page layouts provide visitors with an improved user experience. » New Features - New features on the web site include Find a Product and Product Finder of the web pages, news and events notices, a drop-down box providing direct access to web pages, a site index, and a Literature Library page. In the new website, Asda ICT has also announced the release of several new products including; Industrial Boards, Industrial Display and Industrial Systems, and an Open CEM ODM model for integrated management and service. "Our new web site and new products clearly demonstrate our commitment to raising the level of customer service in dedicated Customer Service," said Tony Hwang, Chief Operation Officer of Asda ICT. "We are merging the physical layer with the virtual layer to become the first truly CEM-enabled and professional customization company." According to Mr. Hwang, all Asda product come with the standard form factor that allows for additional modifications and services to be added on-the-fly to meets various needs. Alternatively, Asda ICT also offers a dedicated specification with various display size. The premier offering includes boards to Systems offering that targets customers who seek one stop shop of Industrial Control Solution and delivered on demand and on time. New Taipei, Taiwan, March 9th, 2011 – Today, Asda ICT announce new industrial-grade Panel PCs were introduced. Available with 10-, 12-, 15-, 17- or 19-inch diagonal displays and touch screens, the Industrial Systems family of Panel PCs is powered by a fully integrated 1.6 GHz Intel® Atom™ based single board computer (SBC) which offers a multitude of I/O connectivity options. The front bezels on these Panel PCs are environmentally sealed to comply with NEMA 4/IP65 specifications to prevent damaging moisture, dust, and dirt from getting into it. They are ideal for Military, medical, utility, security, transportation, Factory automation and food processing applications that need rugged system integration and minimal space requirements. Asda ICT Industrial Systems family of Panel PCs has unique design features that allow each unit to meet and exceed industry standards for RF emissions, susceptibility, and shock/vibration. The systems have been tested for electrical and electromagnetically induced or radiated interference that could possibly degrade its performance when electronic and electrical systems are in close proximity and confined spaces. They comply with IEC 61000 electrical Fast Transient, Surge, Drop in Power, Conducted Susceptibility, and Conducted Immunity tests. Also the systems is tested and compliant with FCC Part 15 B and CE EMC Directive 2004/108/EC. Additionally, they can withstand 1.0G vibration and 15Gs of shock. The products support operating systems such as Linux, Windows XPe, CE 6.0, WES7, and Windows 7. The SBC includes 2 GB of system memory with either or both an optional customer-installed CompactFlash SSD. I/O support includes a Gigabit Ethernet port, four USB 2.0, and two RS-232 serial channels. The system requires +12V dc but a version that accepts +24V to +48V dc is also available. Asda ICT can also customize the Panel PC for ODM applications with a black chassis, custom art for the bezel, and preloaded operating system. The Asda ICT application engineers will assist the designer with technical details and lead times. New Taipei, Taiwan, August 26th, 2011 – Today, Asda ICT new military grade panel PCs and LCD displays are designed for the use in ultra-extremely critical environments and rough weather conditions. This ultra-tough design was developed to survive both military and industrial applications. These systems are MIL-STD 810F compliant. We also offer a customized system with MIL-461E to fit very unique requirements. The new announcing products were shown in Taiwan Exhibition for Military, the Taipei Aerospace & Defense Technology Exhibition(www.tadte.com.tw), where the professional audience was astonished by our product range, availability, ruggedness and flexibility in customizing these products. Asda’s expertise in rugged system enclosure design combined with industry-leading portfolio of application-ready boards and platforms provides military contractors with a best-in-class systems designer under one roof. - Expertise in ruggedization, certification, full system integration and total custom solutions. - Extended product lifecycle management with long-term support. New Taipei, Taiwan, August 11th, 2011 – Today, Asda ICT new industrial-grade Panel PCs were introduced. 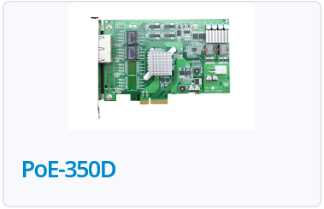 The ADB-1000 is a dual channel graphics and video processing A/D board for Liquid Crystal Display (LCD) monitors incorporating Picture in Picture, up to WUXGA(1920x1200) output resolutions. The ADB-1000 provides all key A/D board functions required for image capture, processing and display timing control. Functions include a high-speed triple-ADC and PLL, DVI receiver, high quality zoom and shrink scaling engines, Motion Adaptive De-Interlacing (MADI), Low Angle Diagonal Interpolation (LADI), an exquisite on-screen display (OSD), a on-chip micro-controller, and a dual channel LVDS transmitter for interface to displays with screen split solution . With all these functions integrated onto a single board, the ADB-1000 reduces the cost of high-end multimedia LCD monitors while maintaining a high degree of flexibility and quality. ASDA Industrial display kits series provides various industrial grade LCDs which are verified to work with all Intel embedded boards and systems. To better serve our industrial customers, we offer wide temperature, ruggedized, high brightness, Industrial grade panels with longevity supports. ASDA also offer panel customization services as follows: Backlight Enhancement, Touch panel integration, Optical bonding services and LVDS cable customization services. The Asda ICT application engineers will assist the designer with technical details and lead times. New Taipei, Taiwan, Jul. 13rd, 2011 – Today, Asda ICT plans to release its Open Pluggable Specification (OPS) compliant digital signage player IPS series. The IPS series complies with Intel OPS (Open Pluggable Specification) standard and is powered by an Intel Atom D525 dual-core processor (fan-based) and Intel Atom N2800 dual-core processor (fanless) with integrated graphic module for Full HD playback. Compliant with the Open Pluggable Specification (OPS). IPS is constructed by Aluminum die-casting and heavy-duty steel its slot-in module design effectively lowers deployment and field maintenance costs to simplify device installation, usage, maintenance and upgrades. IPS media player enables digital signage manufacturers to deploy systems faster, with lower costs for development and implementation. 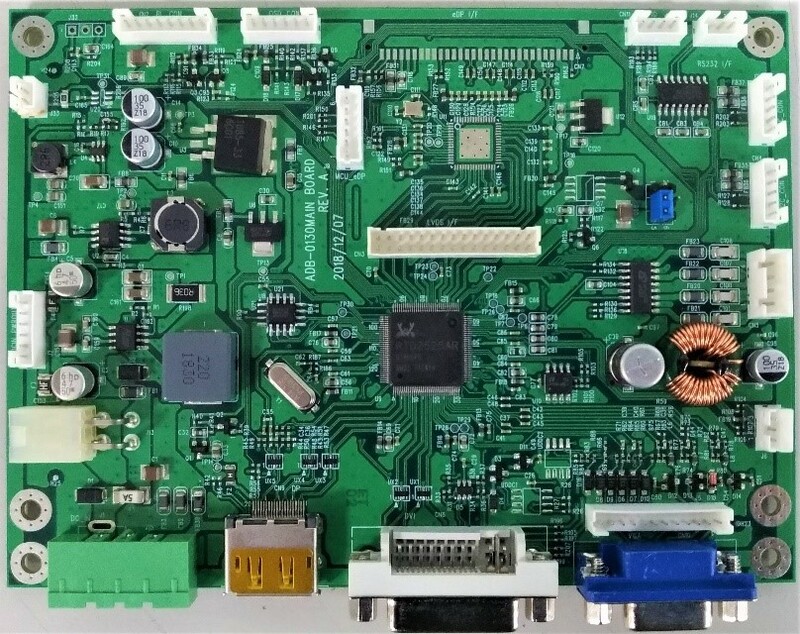 Its slot-in module is connected via a JAE 80-pin connector, and includes the HDMI, DVI-D, DP, UART, and USB2.0 signals. The player-screen communication interface via UART and HDMI CEC provides status reporting and control, and also supports digital audio/video signals via HDMI or display port, for picture-perfect content reproduction. IPS also supports 1x GigaLAN, 2x RS232 ports, and 6x USB2.0 and offering a great choice for data communication in various display applications. The entire design makes digital signage applications more intelligent and connected. In addition, Adsa ICT’s IPS combine with Asda ICT’s ODP series which can offer customer a broad range of display portfolio to satisfy their various needs to both indoor and outdoor in the market. "The Open Pluggable Specification was created by Intel to address fragmentation in the digital signage market and simplify device installation, use, maintenance and upgrades,” “With the specification, digital signage manufacturers will be able to deploy interchangeable systems faster and in higher volumes, while lowering costs for development and implementation." The Open Pluggable Specification (OPS) is supported by industry leaders in digital signage, including Microsoft*, NEC Display Solutions* and the Taiwan Digital Signage Special Interest Group*. New Taipei, Taiwan, Jun. 28th, 2011 – Asda ICT plans to release its Panel PC series product line including both APC and OPC to meet various needs in the market. Asda Open Frame Panel PC(OPC) series provides a bezel-less design and thus is easily integrated into any embedded applications. This series supports rear and VESA mounting with 4 versatile mounting bracket for easy installation. Asda Panel PC(APC) series provides rugged aluminum front bezel design with modular architecture to be used with hazardous and rugged environments and applications. This series supports rear and VESA mounting with 4 versatile mounting bracket for easy installation. The series with all-in-one design concept quickly fulfill diverse vertical applications. The Asda ICT’s Panel PC combines a CPU board, LCD display, and user-friendly touch screen within a slick, compact chassis. Each product is a compact, highly integrated, network-ready computer with the fullest I/O connectivity. The Asda Panel PC industrial touch panel computer is an all-in-one and compact system designed around a highly integrated Intel® NM10 Express chipset motherboard computer which can be equipped from 7 to 32-inch SVGA TFT LCD display. Features an embedded Ultra Low power consumption Dual-Core Intel® ATOMTM CPU and some models with a Fanless cooling system, it offers a compact design for limited space environments to meet the demanding performance requirements of business and industrial applications including factory / warehouse / home automation, POS, kiosk, network communication and information terminal. New Taipei, Taiwan, May 26th, 2011 – Today, Asda ICT announce the patent which is a high efficient heat spreading design applied on Liquid Cristal Display (LCD) monitors or display devices with Light Emitting Diode (LED) backlight. The patent relates to a hest spreading design for conducting the heat generated by LED backlight board of LCD monitors or display devices. Recently, LED is applied to the backlight module of LCD dramatically for energy saving, better brightness and better light source lifetime than Cold Cathode Fluorescent Lamp (CCFL), but the heat generated by the LED circuit board become a significant subject. In order to resolve this heat problem, Asda ICT’s R&D engineers invented two heat spreading designs for monitors or display devices with LED circuit board, which conducts the heat generated by the LED circuit board efficiently. New Taipei City, Taiwan, Feb. 25th, 2011 – Today, Asda ICT expand her product portfolio into three category, Industrial Boards, Industrial Displays, Industrial Systems. Asda offers high-performance industrial control products by combining the advanced processing capability of Asda\'s integrated and experienced design with award-winning hardware and user-friendly firmware and software that incorporate the leading trends in industrial control technology. Supporting a wide array of display size and CPU platform, our solutions help businesses of all sizes efficiently meet their mission-critical area. High-availability hardware design and excellent customization services protecting your investment and ensure your business continuity. Asda ICT is also expanding its product range to include so-called Advanced RISC Machine (ARM) architecture. Based on microprocessors that deliver particular savings in terms of power consumption, Asda ICT aims to develop its first own modules and boards before the end of this year for deployment in primarily mobile application areas for industry, factory automation technology, infotainment and military – both on a standardized and customer-specific basis, and comprising a high degree of support in terms of mechanic and interfaces. Systems such as Panel PCs are also to be offered with ARM technology in the future. \"This allows us to optimally complement our existing product portfolio that is largely based on the x86 processors of our strategic partner Intel, thereby enabling us to serve our customers on a more extensive basis for applications that were previously not possible. CEM(Customer Engagement Model) is a methodology to engage qualified partner to insure their success, and is a commitment to maximum partner’s satisfaction. Combining engineering competence with design capabilities, Asda ICT is a trustworthy partner for our CEM clients. We manufacture products which deliver higher ROI with lower resources required, while maintaining the highest standards. Our efficient workflow management gives birth to accelerated time-to-market. For key components or complete systems, Asda ICT provides quality service with its professional technology. Asda ICT respects customers' domain expertise and realizes their original concepts in tailor-made solutions. The large number of successful products and long-term partnerships are a constant to our commitment in this area. Asda ICT's ID team is capable of designing diverse enclosures based on customer requests. They make sure that the customers are satisfied with look-and-feel of the final products. Whether avant-garde or classic, the customers' desired designs can all be made reality. » Program Manager – Application / Specification define / Component selection / Terms & Quotation. Asda ICT announce the patent, A Waterproof Structure for Electronic Devices. New Taipei, Taiwan, Jan. 7th, 2011 – Today, Asda ICT announce the patent, A Waterproof Structure for Electronic Devices to avoid coolant or moisture contamination intruding into electronic devices. The patent relates to a monitor or a keyboard device, more particularly to a keyboard device having a waterproof structure capable of applying into a moisture condition in the environment. Presently, coolant is essential to a machine or tapping center during the machining process. Most of computer numeric control machine or tapping centers equipped with at least one monitor for monitoring the machining condition and parameters, and at least a keyboard for operating the machine and inputting parameters and programs. The monitor and keyboard are contacted by process engineers or operators frequently. As a result, a lot coolant or moisture is easily transferred onto the monitor and keyboard by the process engineers or operators. The coolant or moisture remaining on the monitor and keyboard impacts the lifetime of monitor and keyboard, especially to the print circuit board assembly (PCBA), in order to prevent the coolant or moisture intrude into inside of the monitor and keyboard becoming a important subject. For solving the problem, Asda ICT’s R&D engineers invented an exquisite waterproof structure for monitor and keyboard devices to prevent coolant or moisture contaminating the PCBA. An object of the present invention is to provide a monitor or keyboard device having a waterproof structure, which includes two waterproof layers to avoid coolant or moisture going to the devices for protecting the PCBA to have longer lifetime than regular design.